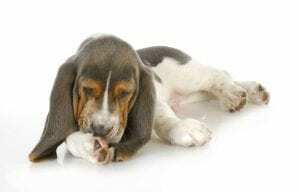 A dog chewing paws can be a troubling sight for a pet owner. You’re having a relaxing evening at home, watching TV or reading a book, when you notice your dog gnawing at their paws. Suddenly, your mood changes, as you listen to the sounds of your beloved pooch going to town on those paws and nails. Is this a sign that something’s wrong? 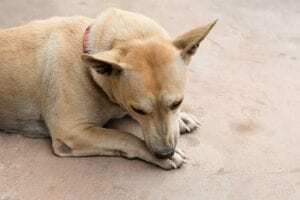 Is your dog licking or chewing due to some sort of health problem? Do you need to schedule a visit to the vet. 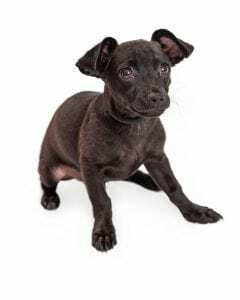 The following are just a few of the reasons why your dog might be licking or chewing excessively, and what can be done about it. A dog paw is very sensitive. 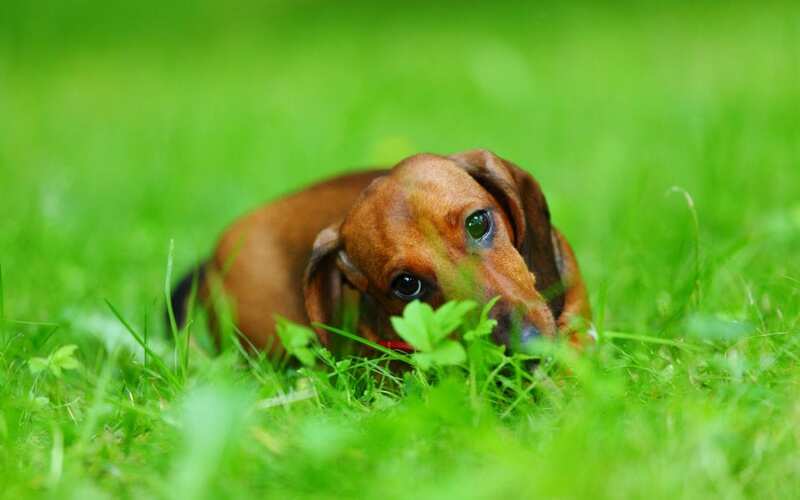 If your pup is biting or licking their paw excessively, problems could result. The key to stopping the licking or chewing is to determine the cause and get it addressed. In some instances, however, separation anxiety is so severe that it will require a more complex solution. Your vet can recommend the best options for your dog’s particular situation. If the reason is stress, it’s important that you know the signs so that you can get the help you and your pet need to fix the problem. Even if your pup isn’t chewing their feet, it’s important to check their paws regularly to make sure they’re healthy. Look for redness, and check to see if any part of your dog’s paw seems tender (they’ll likely let you know). While you don’t need to panic if you see your dog biting their paws, you can’t ignore the behavior, either. Take your pet to the veterinarian to get to the root of the problem so that it can be successfully addressed. Thanks to this product my Westies coat and skin issues have improved greatly. I took her to the vet just yesterday for an issue of a tooth infection and set up appointment for surgery and teeth cleaning. I was taken back when the vet said “I’ve never seen Sophie’s coat and skin look so great”, I mentioned the two mentioned changes I made..long over due. When Sophie was a puppy, coming out of a puppy mill..the first vet said a certain lower cost dog food would be just fine for her…wrong. I learned through error that breeds of dogs with skin issues should be cautious of their diet because that can be a major trigger. I put her on an organic fresh dog food and NutriThrive..I know the food made a bit of a difference but the true hero that put my dogs health back on track was NutriThrive. I was dubious, even the introductory cost being lower, for a senior it was out of my budge. I decided it was either change her diet and add nutrithrive or keep paying for vet bills. The change has been incredible. I would recommend this product to anyone who has their pets health a priority. In the long run, your dog will be healthier , happier and I believe actually extend their lives if we put the proper foods in their bodies. Same as humans, we are what we eat…since I don’t personally want to be identified as a sugary roll and coffee Sophie and I both went on the nutritional adventure together. She’s shown a highly positive change in her health , her skin issues and her energy level. I wish I could see that much progress on my journey…but I fudge she can’t. 🙂 I lost one dog due to a parasite issue which also depleted Sophie until we finally found the proper medication….but she was sick and she was tired….I now see my beautiful pretty girl again with energy and kisses, Max my other dog didn’t make it…so with a great love in Sophie’s and my heart for the memory of another great dog, Maxwell… through his loss it pushed me to act faster and stop listening to vets who knew zero about anything outside the scope of general vet practice and spending way to much of my social security check every month with visits that did little to help her as I saw her fading more each day….I am so very thankful that (and don’t ask me how) I found this web site…and I knew nothing about this vet, or this product. One last leap of faith I bought the three jar special. My oh MY!! Sophie isn’t even half way through the first jar and I doubt its been more then two months and she is a new dog…with a spring in her 12 yr. old step and a beautiful coat to boot. Say yes and love your pet back to life with this wonderful product. Its the real deal…God bless all of God’s beautiful animals that bring us such joy and thank God for Dr. Richter who formulated this product. Thanks Doc, We both thank you from the bottom of our hearts.